Organic, Sustainable, Natural: What’s the Difference? The terms organic, sustainable, locally grown and natural often seem to be used interchangeably when discussing food, but they are not the same. 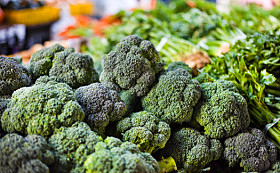 Organic foods may not be locally grown, locally grown foods are not necessarily sustainable or organic, and natural foods may not be organic, sustainable or locally grown. Organic is the only term that has been legally defined. Food items sold as “certified organic” meet regulations in the U.S. Organic Foods Production Act of 1990. Organic foods are grown in soil that is free from synthetic products for a specified number of years and without the addition of synthetic fertilizers, herbicides or pesticides. Organic animals and poultry are fed organic feed and are free of synthetic antibiotics. Organic products need to be kept separate from non-organic products during the production and distribution process. Also, records must be kept for all organic products as they travel from the farm to the store to our plates. Certified organic foods carry the USDA certified organic label. Although some believe that organic foods are locally grown on smaller farms, this is not part of the organic regulations. Today many organic products are raised on large farms and transported across the country. The 1990 U.S. Farm Bill suggests that sustainable agriculture is an integrated system of plant and animal production that improves environmental quality, makes good use of non-renewable resources, includes use of natural biologic controls and cycles, and improves the quality of life for farmers and the community. Foods grown using sustainable agricultural methods typically do not include synthetic herbicides, pesticides, or antibiotics and often are sold to consumers in a local or regional area. Local foods typically are raised in close proximity to the end consumers; however, the distance between the farm and the consumer can vary. In some areas, local is considered to be less than 50 miles, in other 500 miles is used as the guideline. Currently, no official definition for the term “local” exists. Local foods may or may not have been grown using sustainable or organic certified growing practices. The word “natural” is assumed to mean products with limited processing and/or limited manufactured ingredients; however, no official definition exists. Some argue that all food is natural because it is made from products that are grown or raised. The next time you are at the farmers market, talk with the farmer about their growing practices and enjoy a new appreciation for where and how your food is grown. This entry was posted in Food and Nutrition and tagged organic food, sustainable agriculture. Bookmark the permalink. I was glad to see a clear explanation of the terms ‘organic’ and ‘natural’. They are often used incorrectly so this is very welcome. I think organic is the way to go if at all possible but if not, natural food production is the next option. It isn’t always easy but it is rewarding.